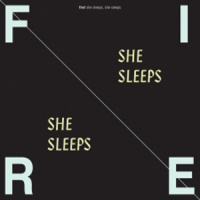 She Sleeps, She Sleeps is the fifth album release from Fire! (yes, that exclamation mark is an integral part of the name), the Swedish supergroup trio of saxophonist Mats Gustafsson, bassist Johan Berthling and drummer Andreas Werliin. It sees the three return to duty as a trio following the distraction of recording and touring with the Fire! Orchestra, with its membership of about thirty. Away from the orchestra, past Fire! albums have seen the trio collaborating with other musicians such as guitarists Jim O'Rourke and Oren Ambarchi. Although their last trio album, (Without Noticing) (Rune Gramoffon, 2013), included no such additions, this time around three of the album's four tracks do include guests, Ambarchi on one track and cellist Leo Svensson Sander on two others. The seven-and-a-half minute opening track, "She Owned His Voice," features the trio alone, and it is a potent reminder of what a fine group this is; the three members are immediately locked into each other, bass and drums providing a tight, driving groove over which Gustafsson gives a textbook example of what he does so well, firing off bursts of focussed, sustained baritone that display his awesome stamina, lung-power and phrasing. Next up, on the longer title track the rhythm section is just as reliable, allowing room for Gustafsson and Ambarchi to trade phrases that sound decidedly angst-ridden and atmospheric. For the second half of the album's forty-four minutes, the trio are joined by cellist Sander who slots in with assurance, although the four-minute "She Bid a Meaningless Farewell" is dominated by a workmanlike drum solo before bass and cello join in to add to the pulse. The album is brought to a storming climax by "She Penetrates the Distant Silence. Slowly" which opens with bass alone and then gradually adds layers of sound and builds momentum before ending with a full-on assault by all four playersaltogether an object lesson in controlled power and dynamics. Aficionados of Fire! will find plenty here to remind them of the group's many strengths; newcomers can confidently join in here, knowing they have a treat in store. Track Listing: She Owned His Voice; She Sings, She Sings; She Bid a Meaningless Farewell; She Penetrates the Distant Silence. Slowly. Personnel: Johan Berthling: double bass; Mats Gustafsson: tenor, baritone & bass saxophones; Andreas Werliin: drums, lap steel guitar; Oren Ambarchi: guitar (2); Leo Svensson Sander: cello (3, 4).